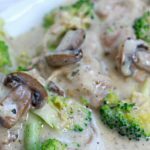 Instant Pot Garlic Mushroom Chicken–a creamy sauce is spooned over mushrooms, tender bites of chicken (and optional broccoli). A delicious dump and go recipe that you can make with frozen chicken. 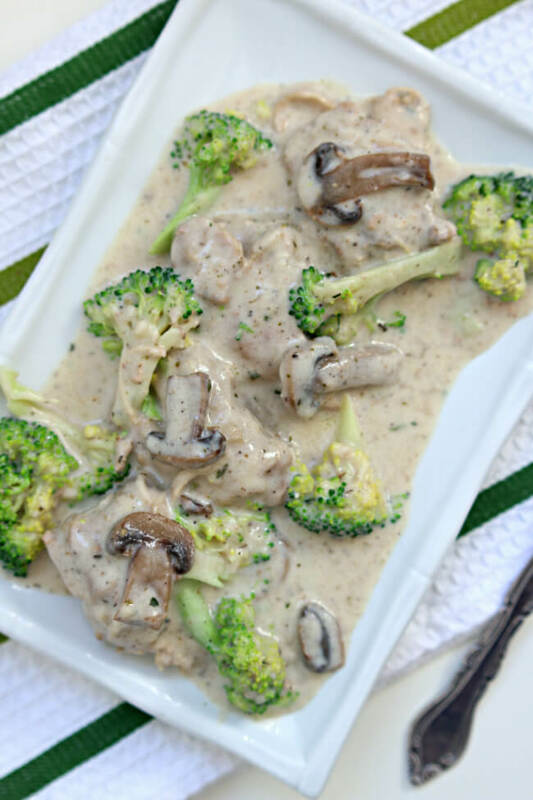 This creamy chicken and mushrooms is so tasty and it’s not made with any processed condensed soups. Plus it’s so fast to get it started. You just dump a few ingredients into the pot and set the timer and walk away. Totally my kind of cooking! I served the chicken and sauce over leftover risotto which was tasty. I think it would also make a great pasta dish. Just start the fettuccine (or another type of pasta) in a pot on the stove the same time you start the chicken in your Instant Pot. The pasta will be ready to go when the chicken is done. Mushrooms: I used plain white button mushrooms. I used 8 ounces but next time I’ll use 16 ounces. They shrink down so much and I really love mushrooms. Chicken: You can use boneless breasts or thighs for this recipe–frozen or fresh. Just check the recipe for cooking times. You can also use bone-in chicken (just add 2 minutes to the thigh times). Broth:I used 1 3/4 cup of water and 1 3/4 tsp of Better than Bouillon Chicken Base. It has great flavor and I buy the huge jar at Costco. Flour: I used flour to thicken the sauce. 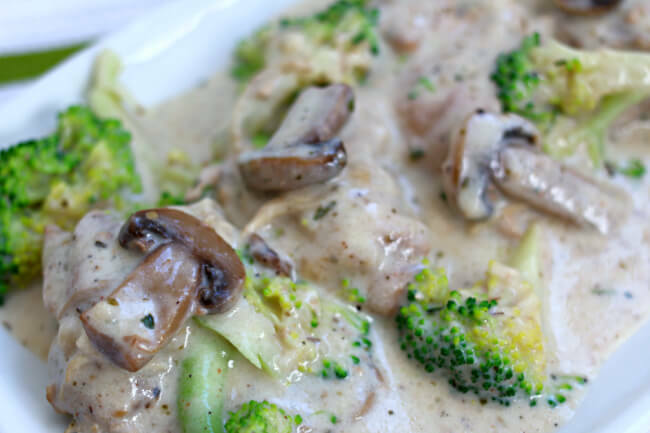 If you’re trying to make this recipe gluten free you could use a cornstarch slurry to thicken the sauce. Just mix 1/4 cup of cornstarch with 1/4 cup water and stir until smooth. Add it into the pot. Broccoli: If you choose to add broccoli you have to add it after the chicken is pressure cooked. It gets way too mushy to add at the beginning. (If you’re interested in cooking broccoli in a separate Instant Pot here is how I do it). You can use fresh broccoli or frozen broccoli, it’s up to you. To make Instant Pot Garlic Mushroom Chicken I used my 6 quart Instant Pot Duo 60 7 in 1*. I love this Instant Pot because it has the yogurt making function which I use almost weekly. It has two pressure settings (high and low), and there are also little slots in the handles so that you can rest the lid there instead of putting it down on your counter-top. 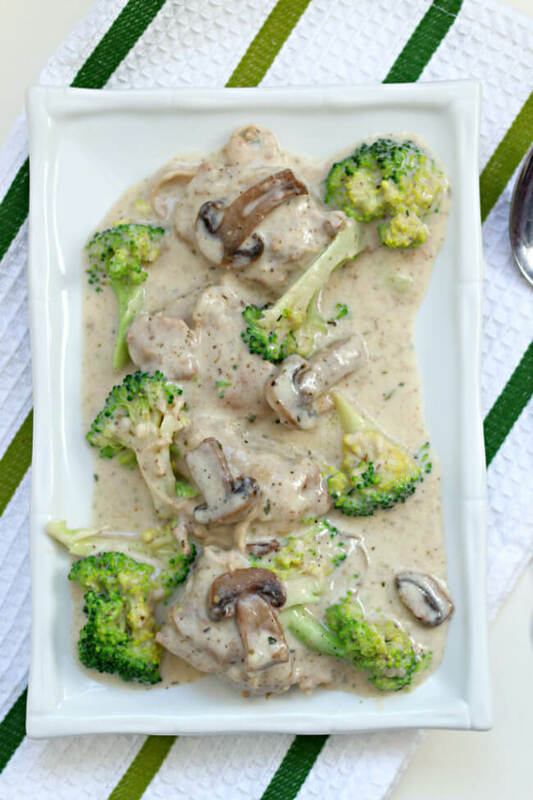 Like this recipe for Instant Pot Garlic Mushroom Chicken? Get all my new recipes delivered to your email inbox by signing up below. Do mix all the mushrooms, chicken, butter, broth and spices before you turn on the pot or is it to be layered in the order of the recipe? I just added everything into the pot in order listed. I didn’t stir. This was a winner in my book. I cooked rice, but like the mashed potatoes idea. I used frozen broccoli and Montreal Seasoning since I didn’t have Italian seasoning. Sounds good with the montreal seasoning! Great recipe! I have to try it now! This was sooooooooooo good. I served it over mashed potatoes. I used fresh broccoli (cooked in microwave for about 1 minute) I agree with your comment about the mushrooms … next time I’ll use way more. This. Is. So. Yummy! I made mashed potatoes to go with it which made kind of bland looking but I don’t care! I didn’t have half & half so I used heavy cream which made my sauce thicker than what the pictures here show. I will definitely be making this again! If I use the cornstarch and water, I do not use the flour and half and half? Is that correct? You’d still use the half and half but don’t use the flour. Basically just mix 1/4 cup cornstarch with 1/4 cup water until smooth. Pour it into the pot and it will thicken the sauce. You may have to use more than 1/4 cup. What if I used a can of organic cream of mushroom? Or cream of chicken? How would I modify this recipe for that? Thanks! You could add it in at the beginning with the chicken and broth. Then I would just use 1 cup of half and half instead of 2. Do you think almond milk could be used instead of half & half? I try to lower dairy as much as possible because I get a lot of mucous in my sinuses if I eat too much dairy. Sorry I know that’s gross and maybe too much information. Thank you! Can I verify ? Is it real 1/4 C of cornstarch to 1/4 C water — I tend to make it either too thick or thin in general — just would like to verify — making for dinner tonight. About that. I usually use a little more water than cornstarch just so I can stir it easier. Hi — sounds like a great recipe — I do have to make it gluten free — how much can do you use? Any modifications on the liquids? Thanks again. Err how much xanthum gum do you use?